Sad to say that it really appears this yacht has gone. It is hard to imagine these days, that a boat could be in some sort of peril and not activate an EPIRB. The boat must have suffered a major catastrophe as all the crew were seasoned and highly competent sailors.
" It is hard to imagine these days, that a boat could be in some sort of peril and not activate an EPIRB." The USCG states they activated their EPIRBS a merchant ship went to the co ordinates or near by, they have found the hull still floating 5 meter seas and 50 MPH winds. "On Saturday, a cargo vessel which was helping with the search spotted and photographed an overturned hull which matched the description of the Cheeki Rafiki." Looks like the keel is still attached. The USCG is going to determine if the life raft is still attached to the vessel. If it is then their reasoning will be that's why they abandon the search originally and the situation is - Davy Jones grave yard. Even though a air pocket is probably why still floating. USCG quote survival time for water Temp. To survive they would need to have Dry suits or survival suits as safety gear. Relatives / wife would be able to confirm this factor. If it is vacant then well - grab bag? - Flares. - Why a 12 man life raft for 4 people? although the diagram shows water pockets, which I suppose is the same as water ballast chambers. Oblong shape. Question. If the life raft is missing then EPIRB with LIFE RAFT ? THEN HOW AND WHO LAUCHED THE LIFE RAFT WITH THOSE WINDS ? Care to Comment on the design- Life Raft. "Let the sun shine, let the rain cease, let the lakes and rivers run dry, let the droughts continue so 2015AD, 2016AD & 2017AD Now!! Despite your contrary assertion, the USCG says the boat's EPIRB was not activated. 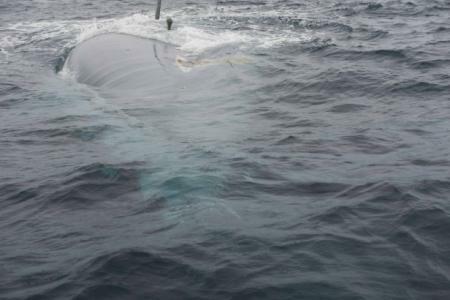 The hull which was spotted by the commercial vessel had no keel, suggesting as I speculated in my original post, that there must have been a major catastrophe. This is further evidenced by the fact that two satellite beacons were activated. These beacons were personal beacons which activate when the wearer is suddenly immersed, as would happen in the event of a sudden capsize and which could have prevented crew from activating the ship's EPIRB. No event will cause a sudden capsize in a flat bottomed boat such as the Benny 40, quite so quickly as the loss of the keel. Ocean racing yachts require that a liferaft be capable of holding all crew. A 40' Cat1 certified boat could require 12 crew at an event such as Antigua week (as you can see from the attached photo). The four man crew taking the boat back were not racing crew, but a dedicated delivery crew. A Cat1 boat requires the raft to be stowed on the working deck or cockpit and must take less than 15 seconds for deployment. They must be buoyant even when still in their valise. Many will float free of the deck during a capsize and require only a tug on an attached lanyard to inflate. 'Water pockets' are drogues, designed to overcome the effects of wind driven drift. What you assumed to be the keel, is in fact the rudder. (The rudder is at the stern, the keel, toward the centre). Thanks for the additional details, Auzzee. So sorry to hear about this catastopy. Regarding 12 person vs smaller liferaft--I spoke with a fellow who was aboard a 6 person liferaft for a period of 5 days with 4 other people--he stated it was miserably cramped for the five of them. So--even if the boat owner only expects to have 4 to 6 people aboard, they may well have a much larger liferaft because it just makes sense. designed to overcome the effects of wind driven drift. What you assumed to be the keel, is in fact the rudder. (The rudder is at the stern, the keel, toward the centre). Water pockets are not drogues they are stability chambers to prevent a capsize.. Designed with a double insulated floor for thermal protection, the bottom and tubes of the liferaft are constructed in a high visibility dayglo yellow material for ease of identification should the liferaft capsize and the new high capacity 75L ballast bags ensure that the liferaft has the highest stability factor compared to any other make or model of liferaft. 1 x Pack Sea Sickness Bags. * VIKING RescYou™ liferafts have a recommended 3 year service interval unless otherwise specified by local regulations. ISO 9650-1 certified, ISAF approved and third party verified.New flourescent yellow canopy enhances visibility from a distance.New viewing port for cross ventilation and view of the horizon.Oversized entrance with inflatable boarding ramp and ladder provides easy and safe evacuation from the water and gives direct access from boat and helicopter for evacuation from within.Easy slide zippers offer the ability to increase freeboard. Four separate air chambers.Sea anchor, rescue quoit, buoyant knife.nternal and external lifelines, righting strap. Four 60 ltr. quick filling, weighted ballast bags offer stability.Fitted with SOLAS grade high-visibility retro-reflective tape.Mounted with SOLAS/USCG exterior strobe light and interior light. Insulated floor provides additional thermal protection. Fitted with ISO pack II equipment pack. Ballast bags keep the liferaft stable, Preventing capsize. "The US coast guard has confirmed the life raft aboard the capsized sailing vessel Cheeki Rafiki was secured in its storage space in the aft portion of the boat, Friday, indicating it was not used for emergency purposes. It said a US navy warship helicopter crew discovered the overturned hull 1,000 miles off Massachusetts. A close inspection of the debris confirmed the identity of the yacht, which had been flooded. It said: "The swimmer determined the boat's cabin was flooded and windows were shattered, contributing to the complete flooding inside. Searchers from the US coast guard, the US air force, the Canadian military and the British RAF, as well as a number of commercial vessels and volunteers, have combed more than 17,000 square miles of ocean in the hunt for the Cheeki Rafiki's crew. Looks like the yacht has hit a submerged object. Polluted Oceans and seas on the rise. Garbage from passenger cruise ships perhaps. Given the tragic nature of this event, I have chosen to respond to Piclarke via PM. Experienced cruisers will understand what happened to this vessel. I am sure an official report will not take long to compile. I am sure I join most within our community in mourning the loss of these sailors, and any others who lose their lives through misadventure at sea.